Earlier this week I praised Guillermo del Toro’s fantasy vision of “Helboy II” put to screen. The same could be said of Andrew Adamson’s humble work in “Prince Caspian”. With the Disney backing and the label at the head of the picture, Adamson could never have turned his franchise into a “Lord of the Rings” or a “Hellboy”. The darkness of these other films is eschewed for bright pictures, clean imagery and simple characterizations of good and evil. But in Caspian Adamson's picture, under cover of bright wholesomeness manages to make a surprisingly violent film. Simplicity is actually a compliment in this case. Before I wrote this review I read a Den of Geek’s open letter to Action Movie Directors and Editors (CLICK HERE to read). While we are bombarded with excessive camerawork, aggressive action, music and editing in our action scenes, in the Narnia series, especially Caspian, Adamson’s classical approach to spectacle is a refreshing throwback to classical epic films. When we last left the world of Narnia the four Pevensie kids (Edmund, Peter, Susan and Lucy) had just saved the Narnians from the evil Ice Queen and walked back through the Wardrobe back to WWII London. It’s now several years later ‘earth-time’ and while waiting for a train at the station, they are suddenly whisked away back into Narnia land. It’s not same Narnia as before, but hundred years later, the land is now ruled by a race of men known as the Telmarines. 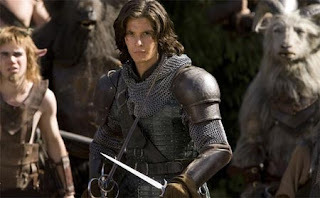 In a military coup their King has been killed and their Prince (Caspian) (Ben Barnes) has fled into exile. The horn given to him by his aide has summoned the former kings and queens of the land (the kids from the first film) back to save the day. But hey, aren’t they just kids? Yes, but Peter still remembers how to brandish a sword and Susan can still fire an arrow. Unfortunately without Aslan the Lion around the kids have to unite Caspian with the remaining Narnians to battle the Telmarine army. The first film in the series “The Lion, the Witch and the Wardrobe” suffered from early growing pains – a lengthy and often boring build up to it’s only brief (but stunning action sequence). In this second film Adamson speeds things up, lessons the awestruck majesty of the land and gets down to business really fast. Three or four perfectly choreographed action scenes anchor the film, which in large part is as plotless as “Lord of the Rings”. There’s a lengthy attack and rescue scene from King Miraz’s castle, a fight involving the evil Ice Queen in the underground layer of the Narnians, a one-on-one sword battle between Peter and the Miraz and the final army vs. army scene. Adamson’s classical wideangele framing, locked down camera, simple but effective shot selection and minimal cutting seems a minor miracle in the light of today’s fashionable cinematic techniques. The creature effects are simplified with familiar beasts (centaurs, gryphons etc) fighting alongside our human heroes, Adamson never revels in his achievements in creating these beasts. There are never overly designed, or overrendered with CGI. CGI was certainly used, but there appears to be as much in camera practical effects which almost always produces a more solid basis of reality. Even my eight-year-old daughter hates this movie. Granted, she had already seen the exquisite BBC mini-series of the Narnia Chronicles and marveled at its highly literate, intelligent and beautifully acted production. She also preferred the retro makeup and effects and even told me they were more "magical" than in either of Adamson's movies. I, of course, would have to agree - not just because she's my daughter, but because I'm me. Hee Hee.